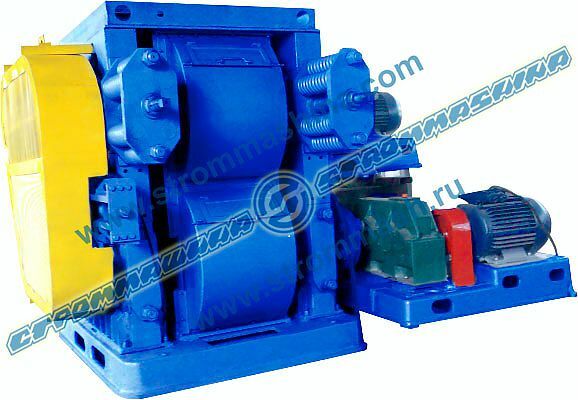 Crusher 101 – ДЧГ 900х700 Crusher GOST 18266-72 (ГОСТ 18266-72) is designed for coke fine crushing. Crusher overall dimensions, mm, max: length 4500; width 3400; height 3700. Crusher weight without electric motors kg 31000. The composition of the Device and the its Operation. The crusher is comprised of four smooth installed in the crusher housing, the crusher housing (the feed mechanism, the mechanism for tire returning), and two separate drives. The rolls are put into the bedplates grooves of the crusher housing: two top ones - (the power-operated one and non-powered one) and two lower ones - (the power-operated one and non-powered one). The rolls have removable tires bolted into the thrust via the V-ring. Rolling element bearings serve as the rolls footings. There are sprockets for tenacious transmission and sheaves for a vee belt transmission drawn up on the roll by cotters installed on the roll. The power-operated rolls have a fixed footing and connected with a drive through a tooth-type coupling. The non-powered ones rotate through the vee belt transmission from the power-operated rolls. The non-powered rolls have movable footing, so when non-crushable elements get in there, rolls may diverge, and after these bodies go through, get back to the starting position due to the action of the springs. Tensioning devices are installed for belt tensioning. The tensioning device is a slide block with a sheave that moves as a stud rotates towards the guideway.